Charlene Reed, a member of the UAMS Foundation Fund Board, from left, Sherry Muir and Susan Long display the award. The University of Arkansas for Medical Sciences has awarded a $100,000 Chancellor’s Circle Grant Award to the occupational therapydoctoral program that is being jointly developed by the UAMS College of Health Professions and the College of Education and Health Professions at the University of Arkansas in Fayetteville. 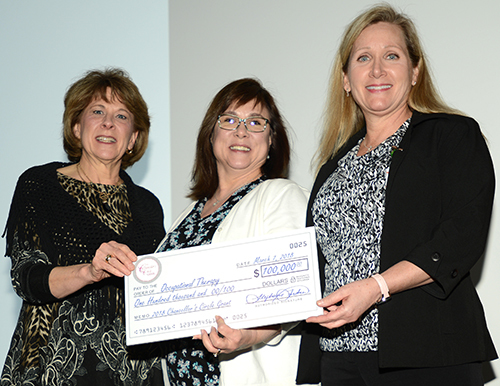 Sherry Muir, program director of the occupational therapy program, and Susan Long, interim dean of the UAMS College of Health Professions, accepted the $100,000 award, which is the largest grant to date for a recipient of a Chancellor’s Circle award. UAMS interim Chancellor Stephanie Gardner, awarded a record $425,000 to 13 UAMS programs at the annual Chancellor’s Circle Grant Awards ceremony and reception March 7. Since 2014, when the awards were first held, the Chancellor’s Circle has awarded more than $1.5 million in grants to 56 UAMS programs. This is the third year the occupational therapy program has received funds from the Chancellor’s Circle for a total of $150,000. Muir, who started work in September 2017, is working on the accreditation process with the Accreditation Council for Occupational Therapy. Already, she has hired an academic fieldwork coordinator, whose job it is to secure clinical opportunities for students, and is searching for additional faculty members. The program, which will be based in Fayetteville on the UA campus and the UAMS Northwest Regional Campus, plans to admit its first cohort of 24 students in the 2019-2020 academic year. Both campuses are working to create educational spaces for the program. At UAMS, a renovation of more than 7,000 square feet is underway on its Fayetteville campus. The occupational therapy program will have a pediatric skills lab, which will be shared with UAMS’ physical therapy program and outpatient clinic. The UAMS campus will also house a handicapped-accessible living space complete with kitchen, living room and bathroom with showers, where students can train. On the UA campus, the occupational therapy program will be located in a house at the top of a hill.